China's Chang'e 3 moon rover (large arrow) and rover (small arrow) are shown in this view from the LROC NAC instrument of NASA's Lunar Reconnaissance Orbiter just before lunar sunset on their first "day." Image released Dec. 30, 2013. China's first moon lander and rover have been spotted on the lunar surface by a sharp-shooting NASA spacecraft orbiting the moon. The Chinese Chang'e 3 spacecraft landed on the moon on Dec. 14, touching down in a region dubbed Mare Imbrium after a five-day trek to the lunar surface. The spacecraft's moon rover Yutu ("Jade Rabbit" in Chinese) was deployed from its Chang'e 3 mother ship soon after, marking two space exploration firsts for China – a soft-landing and rover on the moon. NASA Lunar Reconnaissance Orbiter Camera (LROC) side by side imagery shows before and after landing locale of China’s Change’3 mooncraft. The LRO images show that the large Chang'e 3 lander navigated itself onto the lunar surface, touching down on a thick deposit of volcanic materials, just east of a 131-foot (40 meters) deep impact crater that is more than 1,475 feet (450 m) wide. Chang'e 3's lunar arrival is the first soft-landing on the moon since 1976. Its small, six-wheeled Yutu rover took its first drive near the lander just after being deployed, with each spacecraft taking pictures of the other. Not since the former Soviet Union’s Luna 24 sample-return mission has a spacecraft made a controlled, soft touchdown on the lunar surface. The last soft-landing on the moon by NASA was in 1972 during the Apollo 17 manned lunar landing mission. This panorama shows China's Chang'e 3 moon lander and its Yutu lunar rover shortly after it drove down the ramp to the surface. Yellow lines connect craters seen in the panorama and the LROC image (taken later after the rover had moved by the Lunar Reconnaissance Orbiter). Red lines indicate approximate field of view of the panorama. Image released on Dec. 30, 2013. 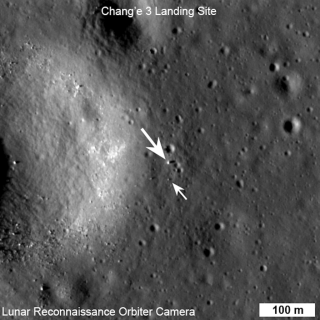 At the time of Chang'e 3's landing, NASA's moon-orbiting LRO spacecraft was far from the landing site so images of the actual event were not possible, said Mark Robinson, Lunar Reconnaissance Orbiter Camera (LROC) Principal Investigator at Arizona State University's School of Earth and Space Exploration. However, 10 days later on Dec. 24, LRO flew over the landing site and its was able to snap six LROC Narrow Angle Camera (NAC) image pairs over a period of 36 hours — about 19 orbits. Robinson said that the highest resolution image was possible when LRO was nearly directly overhead of the Chang'e lander on Dec. 25, skirting high above the landing site at an altitude of roughly 93 miles (150 kilometers). China's Yutu rover is about 5 feet (1.5 m) wide. But it shows up in the NAC images for two reasons, Robinson said. First, the vehicle's solar panels are very effective at reflecting light so the rover shows up as two bright pixels; and second, the sun is setting, so the rover casts a distinct shadow, as does the lander, he added. "We plan on imaging the site each month," Robinson told SPACE.com. "Let's hope Yutu lasts several years. Perhaps it can break the [Soviet Union's] Lunokhod 2 long-distance roving record?" NASA's Lunar Reconnaissance Orbiter mission is managed by NASA's Goddard Space Flight Center, Greenbelt Md. It is expected to continue studying the moon until October 2014, with the possibility of an additional two-year extension. China's Chang'e 3 moon landing site (large white arrow) is seen here in a context view from NASA's Lunar Reconnaissance Orbiter. The small white arrows indicate wrinkle ridge and small black arrows delimit boundary between "red" mare (northeast) and "blue" mare (southwest). This image is 100 km wide and was released Dec. 30, 2013. The Chang'e 3 landing spot includes a large scale wrinkle ridge that’s roughly 62 miles (100 kilometers) long and 6 miles (10 km) wide. That feature cuts across the area and was formed as tectonic stress caused the volcanic layers to buckle and break along faults, Robinson said. Wrinkle ridges are common on the Moon, Mercury and Mars, he said. But more surveying by the mobile Yutu rover will have to wait. Recent word from Beijing Aerospace Control Center is that both the Chang'e 3 stationary lander and Yutu rover are taking their first celestial siesta. The hardware must now endure a first lunar night of the mission — lasting about 14 days as temperatures on the Moon hit rock bottom. Both lander and rover are designed to survive the ordeal — although crossed-fingers may also be part of the survival procedures. The rover and lander have already collected scads of data, according to China's State Administration of Science, Technology and Industry for National Defense (SASTIND), with scientists studying and analyzing data from Yutu and the lander. This map shows the landing site of China's Chang'e 3 moon lander. According to China's Institute of High Energy Physics (IHEP) in Beijing, the Yutu rover got its first X-ray fluorescence spectrum of lunar regolith around the landing site on December 25. Yutu's Active Particle-induced X-ray Spectrometer (APXS) was successfully deployed to about 2 to 3 centimeters above the lunar regolith surface by the robotic arm of the rover. In an IHEP statement, scientists said the Yutu rover instrument has found evidence of eight major rock-forming elements (magnesium, aluminum, silicon, potassium, calcium, titanium, chromium and iron) on the moon, as well as three minor elements (strontium, yttrium and zirconium). Leonard David has been reporting on the space industry for more than five decades. He is former director of research for the National Commission on Space and is co-author of Buzz Aldrin's new book "Mission to Mars – My Vision for Space Exploration" published by National Geographic.Follow us @Spacedotcom, Facebook and Google+. Original article on SPACE.com.